Guessing you might have thought I had dropped off the planet by now. Truth is I am uber-busy at the moment. Halloween is fast approaching and by proud admission, that’s my day! The problem is to get to that day, my schedule becomes a living hell. If you spend any time around LifeIntrigued you already know we host a haunted trail for our friends and family. Each year it gets a little bigger and based on my current plans – this year will be more of the same. Unfortunately, with all the decoration building my commitment to my loyal readers suffered. So… without further delay I bring you fuzzy creatures. I purposely went with this particular post today because no matter how upset you are with my lack of posts … no heart is spurned enough to resist the warming effects of “cuteness”. Give me a cuddly puppy, a furry kitten or a fuzzy chick and you can kiss my worries goodbye. Wait a minute, on second thought, scratch that furry kitten option – them be killers! 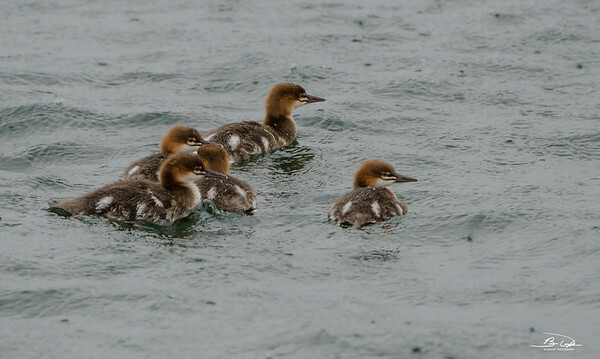 Not the case with these Common Merganser chicks. Pretty harmless unless you are a fish. Hit the jump to see and read a bit more about this encounter. It had pretty much rained most of the night before (since having the Fox encounter) and the sky was still crying when we rose to take on the new day. While we were cruising the downtown area looking for a place to eat the night before, we spotted a small red building proclaiming The World’s Best Donuts. Hmmm, Linda and I have had our share of donuts over our years and this seemed like something that needed a proof point. No problem deciding what breakfast was going to be the next day – obviously we would be dining on the best the iced dough world has to offer. A little rain wasn’t going detract us from our mission. Then again, donuts are no match for the gravitational pull of chicks enjoying a morning swim. We were busy looking for a place to park when I spotted these brown, and white creatures paddling joyfully in the rain under the watchful eye of their mother. The shots do not show it, but there were more than five in the family. It looked like a little kid’s soccer game. Sure, they might all be headed in the same direction as their mother or keeping with the reference, headed at least toward the ball, but every single one of participants were busy taking their own path to get there. This posed a problem for the Beast trying to get them all in and still get the detail I wanted. 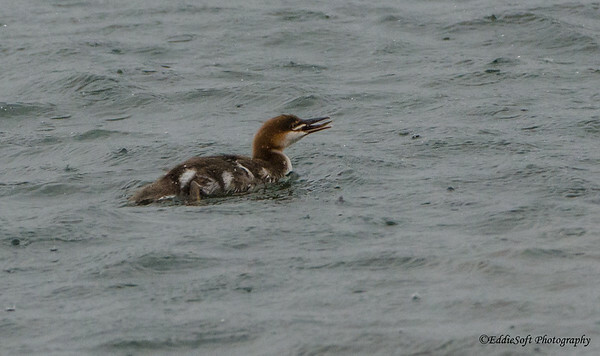 Being acutely aware that I was standing in the pouring rain with expensive camera equipment opted for tighter shots. Wasn’t too long before my outer shell was permeated by the relentless rain – did I smell donuts!?! Pretty happy with how the shots came out. Again, not the best conditions, but the Beast cut through the rain nicely. Oh, almost forgot… the donuts. By then that little shop was PACKED with people. Being already wet, figured what the hell, I can wait in the rain a little more for the World’s Best Donut. Thinking most of the customers had been there before and knew the process. They were moving through pretty quick and ordering rather routinely. Once inside, fearing a soup nazi line issue; I was busy trying to figure out what I wanted to try and had the added stress of picking out Linda’s as well (she was out with the RV dealing with the limited parking issue). When it was my turn I pointed to a bunch of donuts (far more than we could eat for that breakfast). By the way, they were super nice so the soup nazi reference was unnecessary. Once back in the RV we settled in and initiated the taste test. Summary – not bad at all. Admittedly better than my childhood favorite Mel-O-Creme. Maybe even better than the Hurts Donut. Quite the sugar infusion. We will continue to judge it against donuts we come across in the future, but for right now – definitely stop by if you are in the neighborhood. Hell, grab a World Famous Betty’s Pie while you are at it. These ARE very cute! 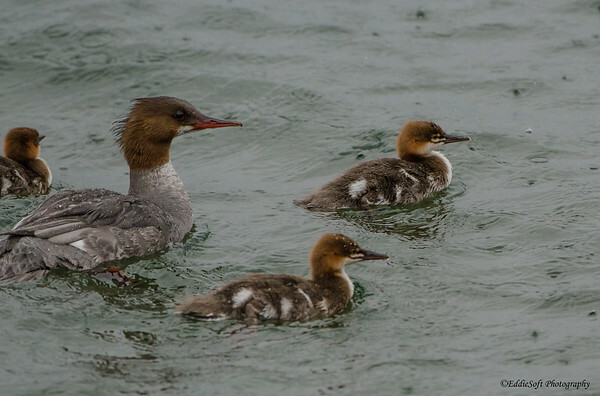 I’ve never seen baby Mergansers–I’ve only rarely seen adult Mergansers! Looks like you are indeed the dedicated birder, out in all kinds of weather and then eating donuts. Isn’t that the sign of a great bird photographer blogger. An individual willing to risk life, limb and colds to bring back images to entertain his many loyal followers! Thank god for sealed camera bodies. 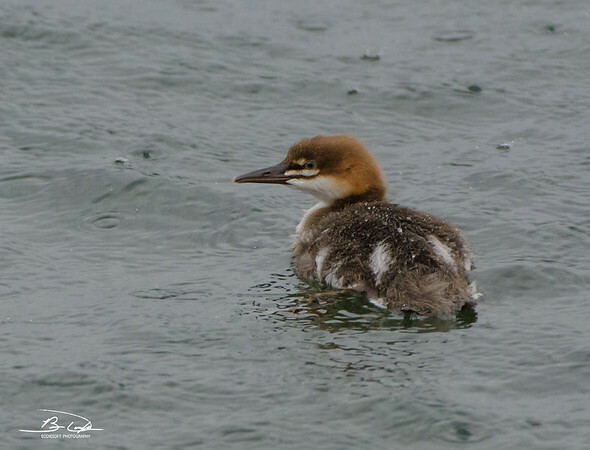 I know for a fact you have a Hooded Merganser. That is one of my nemesis birds and I’m very jealous. Hoping to remedy this on our trip to Texas soon, but for now you are one up on me in this category. Previous Previous post: That Dude Knows His Birds!